Let’s be honest, our pets are fully fledged members of our family and not “just animals.” Don’t they deserve a vacation too? 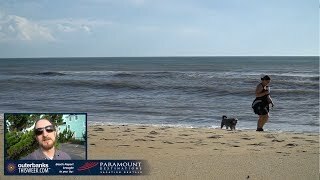 Pet-friendly Outer Banks accommodations would imply they do! While you’re spending hours in meetings, on the phone and behind a computer screen, your dog is guarding the house from intruders, keeping those militant squirrels out of the yard and cleaning up crumbs off of the kitchen floor – it’s hard work that definitely deserves a reward. Between the campgrounds, hotels, motels, inns and beds and breakfasts, there is plenty of room for your family members, both furry and non-furry. Some pet-friendly Outer Banks accommodations offer a limited amount of pet-friendly rooms, so they recommend calling before your visit to check on the availability for both you and your pet. Check out our pet-friendly Outer Banks accommodations listing below to see what places will give both you and your pets the beach experience you deserve. Dare Haven Motel offers clean, quiet and comfortable motel accommodations in a central location, about 3 miles from Fort Raleigh and The Lost Colony site and about 1 mile from downtown Manteo. The motel offers 27 rooms, each with a refrigerator, and some have recently been given a very pleasing update. WiFi internet is available. Rooms are set up as singles and doubles with a variety of bed configurations. Guests love relaxing on the wraparound porch or in the courtyard, where there are picnic facilities and a grill. Pets are allowed for a fee. There’s ample parking for boats on trailers, an especially nice touch for fishermen. Dare Haven has been family owned and operated since its inception in 1938. The Fin 'N Feather is an ideal Outer Banks accommodation for folks with boats or those who just want to be directly beside the water. The building, which was essentially rebuilt after being flooded in a hurricane several years ago, is situated on the causeway between Manteo and Nags Head and offers fresh, clean rooms in a traditional motel setting. All rooms feature kitchenettes with refrigerators and microwaves, WiFi, flat-screen TVs, coffee makers and iron/boards. The location is close to some of the area's best restaurants, shopping and attractions. As an extra bonus, your four-legged family member is welcome too! On the oceanfront in Hatteras Village, Sea Gull boasts unbeatable ocean access, comfort and ease. This 16-room hotel offers a variety of accommodation types: 10 full-bed standard rooms, one king standard room, one king studio, three king efficiencies and a two-bedroom efficiency. During your stay, you’ll receive the KEES Standard Amenity Package including 24-hour check-in, keyless entry, soap amenity dispensers, a Keurig coffee maker with starter K-Cups, high-quality linens and towels and free WiFi access. The Sea Gull additionally provides ample parking, a spacious community grilling area and a beautiful oceanside pool with a wraparound pool deck. Sea Gull is positioned directly across from the Stowe on Twelve storefronts, which means easy walking access to cold treats, stylish salon services and scrumptious deli delights. The four-story, brick Anchorage Inn offers lodgings on Silver Lake with an outdoor pool overlooking the harbor. The inn provides fabulous views of the sunset, harbor activity, Ocracoke Lighthouse and Pamlico Sound. Shops and restaurants are just steps away. The Anchorage Inn has pet-friendly rooms on the first floor for $25 extra per night. The inn is open mid-March through mid-November.